"Katherine E" is a 2005 model 80' Hatteras Motor Yacht with a 21'3" beam and is powered by twin Caterpillar C32 @ 1650BHP. The vessel is in pristine condition and a must see. The interior cabinetry is high gloss African mahogany with curvedinterior sketch face interior passage doors throughout. 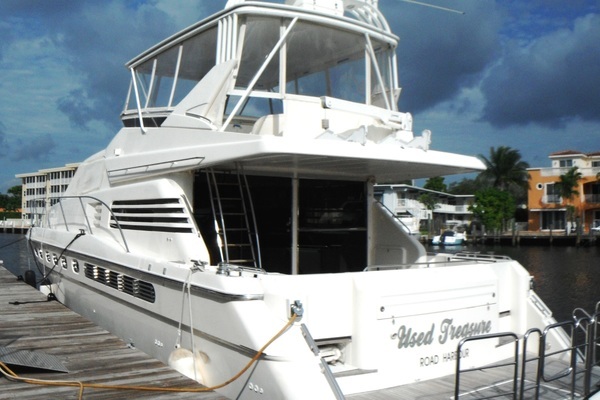 United Yacht Sales New Jersey would love to guide you through a personal showing of this 80' Hatteras 80 Motor Yacht 2005. 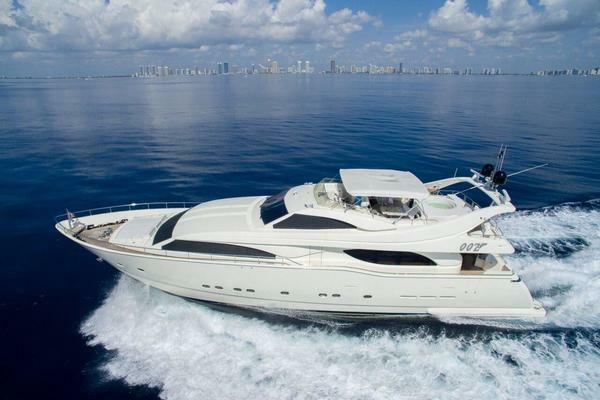 This yacht for sale is located in Fort Lauderdale, Florida and priced at $2,200,000. For a showing please contact us by filling out the form on this page and we will get back to you shortly! "Katherine E" is a 2005 model 80' Hatteras Motor Yacht with a 21'3" beam and is powered by twin Caterpillar C32 @ 1650BHP. The vessel is in pristine condition and a must see. The interior cabinetry is high gloss African mahogany with curvedinterior sketch face interior passage doors throughout. Just inside the salon, twin leather sofas sit on either side ofa centerline pop up TV which separates the salon from the formal dining area. "Katherine E" has an on deck head for easyaccess and a country galley with additional dining. Just off the galley, port and starboard entry doors provide easy accessfor line handling. A singular stairwell provides access to below decks. Aft, a welllighted,full beam master stateroom showcases a his andher head. Forward the bow stateroom features a queen walk around berth with an ensuite head. The port stateroomfeatures a third queen walk around berth with an ensuite head. And unique to many 80’s"Katherine E" features a fourthstateroom with double berth to the hull side with an ensuite head. Aft, the crew quarters provides a VIP stateroom,accommodating a queen walk around berth, as well as a second stateroom with over/unders with a single head. Curved sliding doors, framed in polished stainless steel, give way to a vast salon that benefits from a 21'3" beam.Positioned just inside the salon door are matching leather sofas with twin custom built "AJ Original" custom coffee tableswhich sit on either side of a center line pop up 50" TV and 2 club chairs. Forward a custom "AJ Original" dining table withsix chairs along with buffets on either side built with china storage and on the forward bulkhead is a china cabinet whichhouses a sink, wine chiller and additional china storage. The country galley is fully functional and includes granite Old Gold countertops and backsplashes. For ease ofmaintenance, the flooring is AMTICO and is a custom weaved pattern. Appliances include a subzero, stainless steel, fullheight refrigerator/freezer, full size oven, microwave convection oven, dishwasher, trash compactor, and four burnerceramic cooktop. Forward is a ushaped, Old Gold granite dining table. To port and starboard, there are panagraph doorsleading to the outside for ease of line handling. The crown jewel of the 80 Motor Yacht is the fullwidth master stateroom with six over sized portlights, which allow natural light into the area. The combination of spaciousness, natural light and water levelview will stun anyone who enters the room. The master stateroom features a king size berth with coil spring mattress and cedar lined storage beneath. Arched sketch face doorways and beautiful curved cabinetry dress the area. His and her cedar lined lockers as well as dressers and nightstands provide an abundance of storage and for entertaining a 37" TV with surround sound finishes the area nicely.